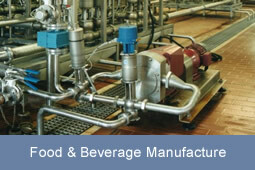 A diverse analytical instrumentation range, covers the critical water quality parameters. Physical water quality, dissolved chemical and indicator parameters can be rapidly reported, by analyser and probe technology - specially designed for the water, waste-water and process monitoring applications. The latest water measurement technology includes sensor and system diagnostics with outputs for real-time control. Dip-probe and flow-through analytical configurations have been specially designed for drinking water, surface water, industrial and waste-water monitoring applications, covering parameters such as TOC, Ammonia, Nitrate, pH, DO and Turbidity. Our Protoc TOC analyser can be used for either continuous single or multi-point TOC water quality analysis. 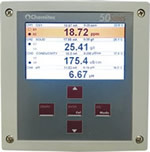 Total Organic Carbon is widely deployed throughout industry to measure dissolved organic contamination and hydrocarbons. Our ProAm ammonia analyser can be configured for continuous or intermittent ammonia measurement (ammoniacal-nitrogen water pollution). 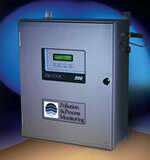 The water quality analyser is installed primarily for effluent quality and pollution monitoring. Dedicated analytical colorimetric measurement is possible using the Colortec Analyser (.pdf ). Multiple parameter water quality probe measurement from a single instrument can be configured using either the IQ Sensor Net system (.pdf 873kb) or Chemitec 50 Series multi-parameter systems (.pdf 1.6Mb). For further information on specific water analysis and suitable instrumentation to monitor key determinands, please click on the relevant parameter symbol. TOC - What is Total Organic Carbon? BOD - What is Biological Oxygen Demand? COD - What is Chemical Oxygen Demand? DOC - What is Dissolved Organic Carbon? UVT / UV254nm / SAC - What is UV Absorption / Transmission? OIL - What is Oil on/in Water? NTU - What is Turbidity? SS g/l - What is Suspended Solids? O2 - What is Dissolved Oxygen? X - What is Conductivity? pH - What is pH testing? ORP - What is Redox - Reduction Oxidation Potential? NH4-N - What is Ammonia? NO3-N - What is Nitrate? NO2-N - What is Nitrite? NTOTAL - What is Total Nitrogen? PO4-P - What is Phosphate? Cl - What is Chlorine? SB - What is a Sludge Blanket?